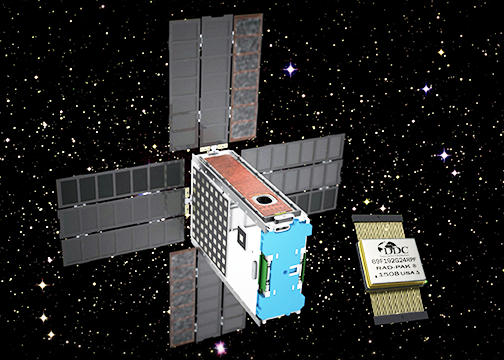 Data Device Corporation (DDC) is informing readers that their Rad Hard high density NAND flash memory has been selected to be integrated within the Pearl Single Board Computer (SBC) that is used as the flight computer on NASA’s BioSentinel CubeSat spacecraft — the Pearl SBC, along with DDC’s flash memory, is baselined for use on multiple upcoming missions for NASA and the DoD. BioSentinel is a NASA space mission designed to study the effects of solar radiation on organisms. BioSentinel will be deployed as part of the first flight of the Space Launch System (SLS), the largest rocket ever developed, and will enable astronauts to explore destinations far into the solar system. DDC’s 192 gigabit NAND flash provides the smallsat spacecraft with compact, high density memory, along with the advantages that a 24-bit bus configuration provides, allowing the use of TMR (Triple Modular Redundancy) error correction, for seamless operation without failure. DDC’s NAND flash is radiation hardened with radiation mitigation RAD-PAK® technology, offering best-in-class spot shielding. RAD-PAK® enables DDC to deliver the latest commercially available microelectronics in a space qualified package, providing designers with a high performance space grade solution at a reduced cost. RAD-PAK®-based solutions offer a total dose immunity of 100 krads or higher, and have been qualified by NASA, ESA, JAXA and thousands of missions for over 20 years without any flight failures. DDC Space Business Unit Manager Dan Veenstra said that the company has worked on many space projects with NASA, and the firm is pleased that they are able to continue to value the high reliability of the company's space products, along with the advanced functionality and performance that DDC is able to deliver, using DDC's space proven and qualified RAD-PAK® technology.